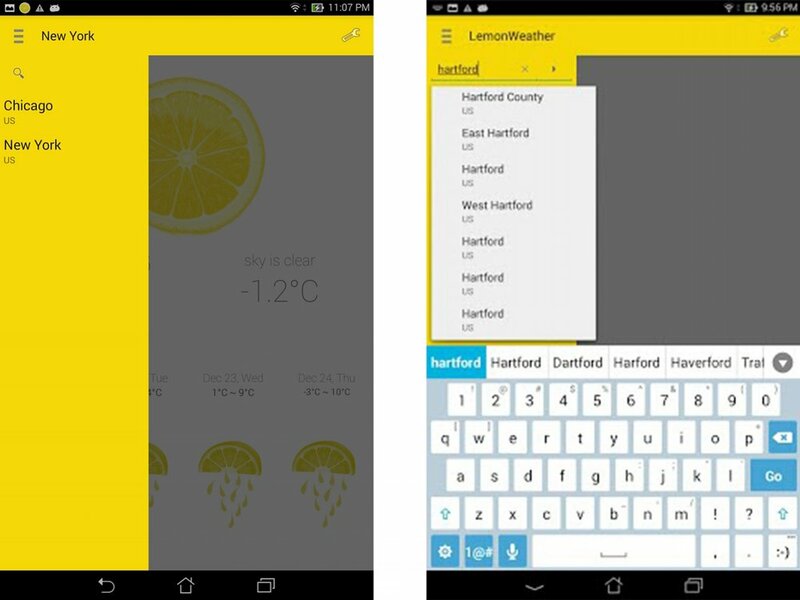 LemonWeather is designed to be a cheerful and convenient weather app. We chose lemon to be our theme because a sliced lemon resembles the sun and gives the user a refreshing feeling. Every lemon icon is hand-drawn and unique. It gives 5-day daily forecast make your travel planned. 36 hours hourly forecast helped umbrella carrying decisions. In landscape orientation, LemonWeather displays more details about the current selected city, including cloudiness, humidity, pressure, wind speed and angle and time of sunrise and sunset. On the right hand side, there will be forecast for the rest of the day 3 hourly. LemonWeeather centers the details of temperature, wind, date and day of current day with four-hour forecast. The location is shown on top with an overflow menu to the right of it. Users can tap on or swipe down from the action bar, or do left swipe on the screen to modify current location. Tapping the drawer icon on the action bar or swiping from left to right brings up the city list that stores all cities that users want to keep track of. On top of the city list is a search box for searching cities. To add a city, users can either click on a search result in the result dialog or simply select a city from the search suggestions. Following selection of a city from the city list, the homepage will display the current weather conditions and forecasts of the next four days. User can also press and hold the city to delete it from the city list. LemonWeather offers a few settings that users can modify according to their preferences. Clicking on the settings icon on the right side of the action bar brings up the settings page, where the users can change display units, enable/disable notification and set notification time. Units change includes temperature unit and wind speed, namely, fahrenheit/celsius and miles per hour/meters per second. A push notification will remind the user to check weather updates daily at a user-specified time if notification feature is enabled. The notification is dismissable and comes with lemon icon and cute sound effect.